Dogs live to please us, and some are bred to love work. Give them a job helping people, and the rewards go both ways. Here are nine dogs who do amazing work every day. Veteran Lon Hodge suffered from post-traumatic stress disorder after his military service and was declared 100% disabled. 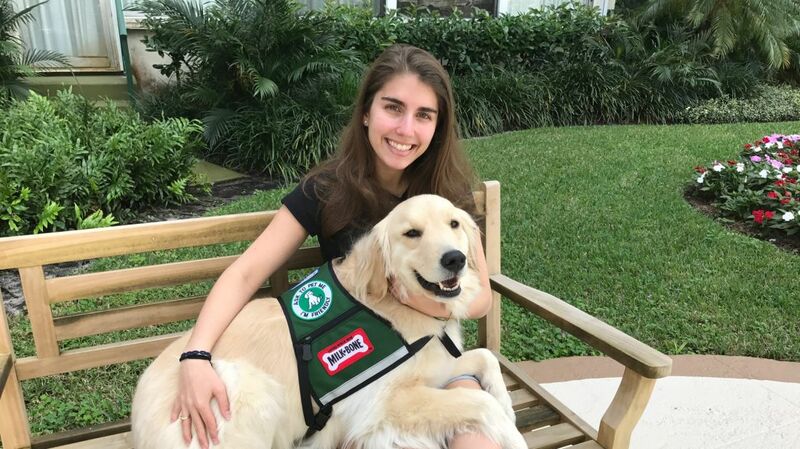 Hodge was paired with a Labradoodle service dog trained through Freedom Service Dogs of America, an organization that rescues dogs from shelters and custom-trains them for veterans with differing needs. Gander was slated to be euthanized when he was taken for training. Now he is Hodge's constant companion, trained to intervene when his voice changes or when there's too much noise. Gander can also open doors, pick up objects, help Hodge rise from the floor, and about a hundred other tasks. Hodge was so inspired that he and Gander now travel the country, advocating for service dog programs that help other veterans. Gander won the 2016 American Humane Hero Dog Awards for top service dog. He also has his own Facebook page. Denver and Anna are full-time hospital dogs. They go to work every day at the University of Michigan C.S. Mott Children's Hospital, where they interact with the young patients. The two golden retrievers (Denver also has some Labrador in him) provide a bit of normalcy for children going through scary procedures who may be a long way from their homes and their own pets. Denver and Anna were specially trained to behave themselves, show affection, and calm and soothe anxious patients. Both Denver and Anna came from Canine Assistants, an organization in Milton, Georgia that trains dogs to help people with disabilities or special needs. Axle is a therapy dog that belongs to Tom Meli, but he is open to helping a number of people with his calm, comforting demeanor. Axle and Tom visit schools, hospitals, and senior centers to share the love. Axle provides stress relief for people with epilepsy and sits with children while they learn to read. He's become quite an ambassador for therapy dogs! Axle was also trained by Canine Assistants. Eggroll is Elizabeth's service dog. He helps her control her epilepsy by providing a calming influence, opening the refrigerator door, fetching medication when needed, and has even learned to dial 911 when he sees an emergency. Eggroll's help means that Elizabeth can safely live on her own. Farley is still a puppy, but she recently got her first full-time job at East Tennessee Children's Hospital in Knoxville, Tennessee. At seven months old, Farley is undergoing a six-week training course, after which she will be the hospital's first full-time facility support dog. The children's hospital has used part-time volunteer therapy dogs for their young patients before. One patient, 16-year-old Kristyn Farley, loved the therapy dogs so much that she suggested the hospital take one on full-time. Kristyn did not survive her cancer, and the new puppy Farley is named in her honor. Farley was purchased through a grant from PetSmart Charities. Angus the springer spaniel has a hospital job, but he's not a therapy dog. Instead, Angus is an inspector, trained to sniff out the highly contagious bacteria Clostridium difficile, commonly called C. diff, the scourge of modern hospitals. Dog trainer Teresa Zurberg almost died from a C. diff infection a few years ago. Her husband, who is a nurse at Vancouver General Hospital, suggested she train a dog to detect the bacteria. Zurberg did so, using the same methods she already used to train dogs to sniff out drugs and explosives. Angus began learning as a puppy, and was deployed last summer to work at Vancouver General. He identifies areas where C. diff is growing so that the hospital can do a targeted cleaning and ultraviolet disinfection. Angus is doing so well in his job that Zurberg is kept busy training dogs for other hospitals. In fact, he's been so impressive, the Vancouver hospital is adding a second C. diff-detecting dog. You can keep up with Angus through his Facebook page. Chief Lee Laubach of the Allentown, Pennsylvania, Fire Department took on a trained arson investigation dog in 2011. Judge is a Labrador retriever who can recognize the scents of many different accelerants commonly used in arson cases. He's investigated hundreds of suspicious fires, leading to quite a few arrests and a substantial drop in arson cases in Allentown. Judge is also a public relations dog, accompanying Chief Laubach to schools to teach children about fire safety. Judge won the arson dog category in last year's American Humane Hero Dog Awards. Judge has his own Facebook page.